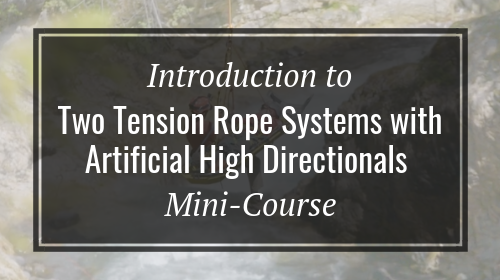 Join us inside this mini-course as we explore Arizona Vortex principles, two tension rope systems, Bowline knots, dynamic directionals, and more. This course was specifically designed around the needs of the Volcano Rescue Team (VRT). A heavy focus was placed on the use and construction of the Arizona Vortex, a new piece of equipment for the team. In conjunction with artificial high directional work, a large amount of two tension system, knot craft, and high angle offsets are covered. All of these together allowed for a class delivered around the cutting edge of high angle rescue techniques currently being used by the industry. Our goal here at Rigging Lab Academy is to minimize the time allotment for learning critical technical concepts and set you on a path to higher learning and a solid knowledge base. Jason is an avid rope rescue enthusiast. He took a specific interest in the technical rescue aspect of the fire department, got assigned to the county’s heavy rescue squad, and developed a passion for rope rescue. He's been lucky enough to participate in classes with people from all across the rope spectrum. As such, he sort of adopted the rope rescue program in his department as his own, and he’s in the process of writing manuals and developing training.He has big visions of changing the “old school fire department rigging culture” from antiquated tactics that are no longer accepted in the rescue world, to more modern and efficient rigging. To Jason, it's important that people who practice rope rescue craft an understanding of the “why” behind the “how”, something that is not often something explored in the fire department rescue world. As an instructor at Rigging Lab Academy, Jason offers a great perspective from both inside and outside the fire rescue world which allows him to convey important messages to his audience in a very relatable way.When he's not busy at the firehouse he works at in Loudoun County, VA, Jason loves to spend time with his two daughters. Another super informative course from Rigging Lab Academy. Great written content and high-quality videos. You won't regret enrolling in this one. This was an awesome course. Thank you for sharing the material! Stay safe. Very well put together easy to understand and a safe practical system. Great job. Thank you, Rigging Lab Academy, your online courses are excellent. Thank you for enriching us with knowledge! Good lecture -- very well set up. This was a very good mini-course! This is a great course! A true and actual use of rigging, anchors and rope systems in a real-world scenario. The instructor, Jason, is well spoken and well educated in rope rescue. Ready to Start This Mini-Course?